Several Sigma Rho brothers & Beta sweethearts from the classes '59 t0 '67 met for a reunion May 1 - 5, 2016. The organizing brothers included: Larry Gahan '60, Steve Knapp '61, Sam Leeper '62, Dave Polaski '63, Phil Yenerich '64, Mike Holbrook '64, Scott Harris '66, and Don Huisinga '67. Their activities included hiking, biking, mountain jeep riding, golf, tennis, site seeing and shopping. 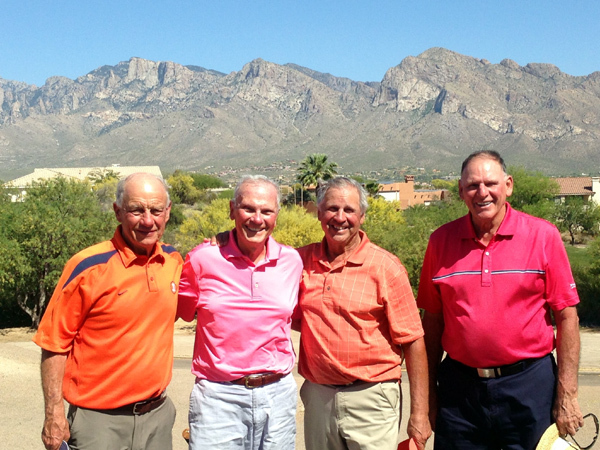 Here we see the golfers getting ready to tee off at the El Conquistador in Tucson, Bob Lorenz '67, Mike Holbrook '64, Ken Polaski '67 and Don Huisinga '67.